As sports video games have shown us, sports are just games with off-the-court metagame layers attached. Also pageantry and juicy, juicy drama. Overwatch League follows this formula, making it ripe for a game in the most thrilling sports-adjacent genre of all: dating simulator. Wait, I mean management. OWL 2K18 is a work-in-progress fan game by Nancy Zhou. It was originally a project for her game programming class, but she continued to develop it afterward. You play as somebody who’s just plunked down $20 million on an Overwatch League team slot. Teams have difficulty levels: for example, NYXL is easy mode, and Shanghai Dragons is extremely hard. You then assemble a team from a selection of real players (as well as some popular personalities who aren’t in OWL) and train them up over the course of six in-game months. The goal is to win a bunch of matches by managing team compositions and players’ personal abilities and then, eventually, to take home gold at the grand finals. Between matches, you can practice, scrim, stream, and—I’m so glad this is an option—hang out with your team at Disneyland. You can also upgrade your team house and coaching staff to boost your players’ stats and the number of team compositions they have access to during matches. Then there’s the “bond” mechanic, which lets you do, uh, vaguely romantic things with your players. These things are strictly PG-rated, such as getting dinner, going to the beach, and queuing up for Overwatch matches together. 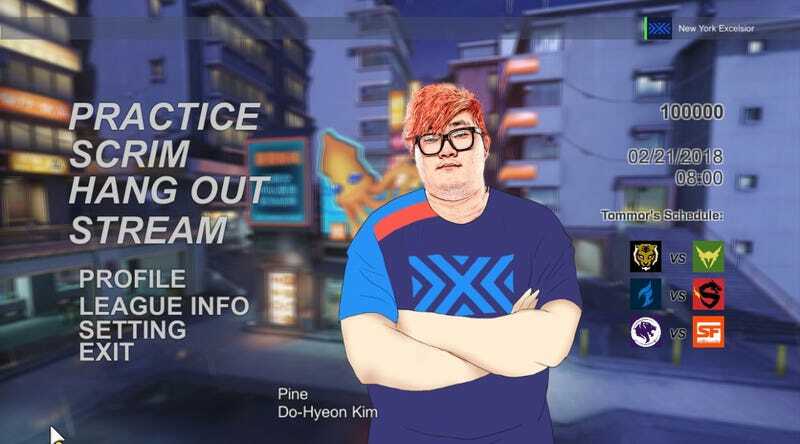 OWL 2K18 began life as a dating sim, which is where these elements—which feel a little out of place in the whole “team manager who wins and, crucially, avoids causing a scandal that rocks the entire esports scene” fantasy—came from. OWL 2K18 isn’t out yet, and Zhou isn’t sure she’ll end up releasing it. Still, what’s already there is impressively elaborate. I hope she decides to put the game out there, if only so I can fulfill my dream of giving the Shanghai Dragons the 40-0 dream season they so richly deserve.